Do you ever find yourself staring at a dessert table, forced to choose between digging into a big pile of cookies or tackling a tree of cupcakes? Cookies deliver a nice, satisfying chew, while cupcakes, if they're done correctly, combine a soft, fluffy cake with a smooth, creamy frosting. But what if I want the best of both worlds? 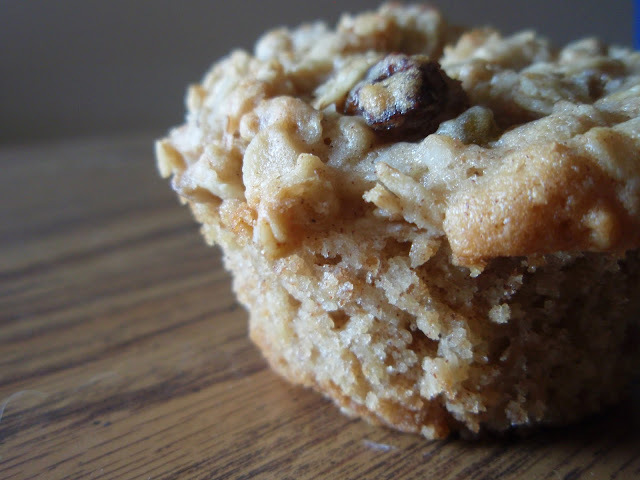 Luckily, I can have it, all in the form of an oatmeal raisin cookie cupcake. It begins with one batter that gets split into two portions, one which becomes the cupcake, and one that gets combined with coconut and more oats to turn into the cookie-like topping. It's wholly satisfying, bringing chewiness as well as cakey-ness all in one bite. Further, there's plenty of aromatic cinnamon involved, so you know I'm happy. Speaking of two for the price of one, I'm putting up two posts today--this one, and another over on The Back Burner, the blog for the awesome site called Key Ingredient. I'll be writing about a new sweet treat every Thursday, so feel free to visit early and often! Today's feature is a caramel apple pie cupcake, and as I mention in that post, it's the best I've ever made! Preheat oven to 375 degrees. Line 3 standard 12-cup muffin tins with paper liners; set aside. Whisk 2 cups oats, flour, baking powder, baking soda, salt, bran, and cinnamon in a medium bowl; set aside. Put butter and sugars into the bowl of an electric mixer fitted with the paddle attachment; mix on medium-high speed until pale and fluffy. Mix in eggs, 1 at a time, and vanilla. Reduce speed to low. Add flour mixture, and mix until just combined. Mix in sour cream. Stir in raisins with a rubber spatula. Transfer 2 3/4 cups batter to a small bowl, and stir in remaining 1 3/4 cups oats and the coconut; set aside. Spoon 2 1/2 tablespoons plain batter into each prepared muffin cup; top with 1 1/2 tablespoons oat coconut batter. Bake until golden and a cake tester inserted into centers comes out clean, 18 to 20 minutes. Transfer to wire racks; let cool completely. These make fun minis, too! Gorgeous! Their texture is fabulous. I hate having to choose between two of my favorite desserts...and really I just always end up eating one of each. But these cupcakes save me the calories and much duress! Fabulous. Those look really good, but I miss your usual perfect swirls of cupcake frosting! Smart move, Grace. I never can decide when I look at a dessert table either. You've solved the problem! Like The Back Burner. Thanks for the link. What fun you'll be writing for them! What an idea. No question about it. Will have to try these. The idea is as much fun as cupcakes with a ball of cookie dough baked inside. The texture sounds lovely. I usually take one of each and try to split them with someone:-)...these look awesome! 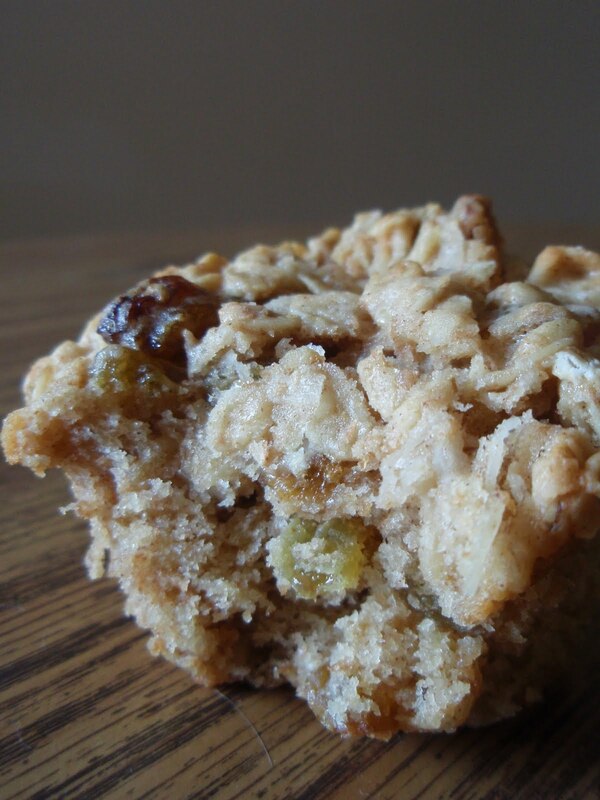 Oatmeal Raisin is one of my all-time favorite cookies so in cake and cookie form all-in-one - oh yeah! I'm guessing that the top gets all crunchy like a cookie and the bottom is cakelike - I love the sound of that! Those look wonderful. I wonder if I could pull them off for breakfast. I love the name of this recipe! It's so fun :) It's definitely the best of both worlds!!! Oh, that looks fun! I've seen cupcakes with cookies bottoms, but never cookie tops; I would love to eat about 10 of these. Perfect combo of cookie and cupcake...maybe with just a smear of frosting??!! Can't wait to try these! A muffin with cookie topping..wow..sounds and looks so cool! These look amazing. I'll have to bookmark them and make them myself! Great idea. Your cookcakes look absolutely fantastic! I made a new kind of cinnamon rolls last weekend. I ought to post them. Your cinnamon reminded me. Meanwhile, maybe I can whip up a batch of these cookie-cakes! Grace, I believe this is what's commonly know as outdoing yourself. You know... I've been thinking that I need to simplify my life... THIS is how I want to do that. No more decision making between cookies and cupcakes. Yes. Brilliant. I prefer cupcakes topped with cookie over frosting. Then again, I was the weird kid who removed the frosting from most desserts that came with it. But I still say a cookie on top is better than frosting :). These look like a perfect breakfast treat- and something my in-laws would love, which is always good! First time here…This looks really delicious...Following your blog straight away..If you have time Check out my blog too.. I am having a Giveaway..
Oooh, they do look delicious Grace. Heading over to Key Ingredient asap. Is this the new project you mentioned before? Well done you. You mean we are supposed to decide between a cookie OR a cupcake?? Oh, my goodness. Let the apologies begin. Cookie and cupcake in the same place? Love this concept. I must have this in my life. Brilliant, just brilliant, is what I say to this! The best of both worlds works for me! I just love two for the price of one!! do drop by mine sometime. I'd be perfectly happy with these muffins as well.I just put some pumpkin muffins in the oven but I am on a baking spree. Anytime I see oatmeal in a recipe, I am instantly drawn to it. I think you may have just out done yourself this time Grace, this is a work of genius! Oooh I love the idea of cookies and cupcakes together! These sound perfect. This is intriguing indeed. And really, no need to choose between a cookie and a cupcake--you deserve both! Grace, this look so amazing, nice texture and the ingredients in it are just heaven. The pictures are awesome as always. A cookie and a cupcake all in one? Genius! And I'm sure it has half the calories of both, right? LOL I wish! I need to make these ASAP! My kids are going to think I am such an awesome mom - thanks Grace! Missed your blog, but glad to see this featured..these look amazing!! My hubby would love these!! This is a wonderful combo! the ground cinnamon and vanilla... i love the way they were combined into your recipe.. great job!